Black Swallowwort is an invasive weed (imported from Europe about 200 years ago) called . It has been found growing in fields, the edges of woods, and in suburban and urban locations. Black Swallowwort is everywhere. It threatens native plant habitats and has been listed on the New England invasive plants list. 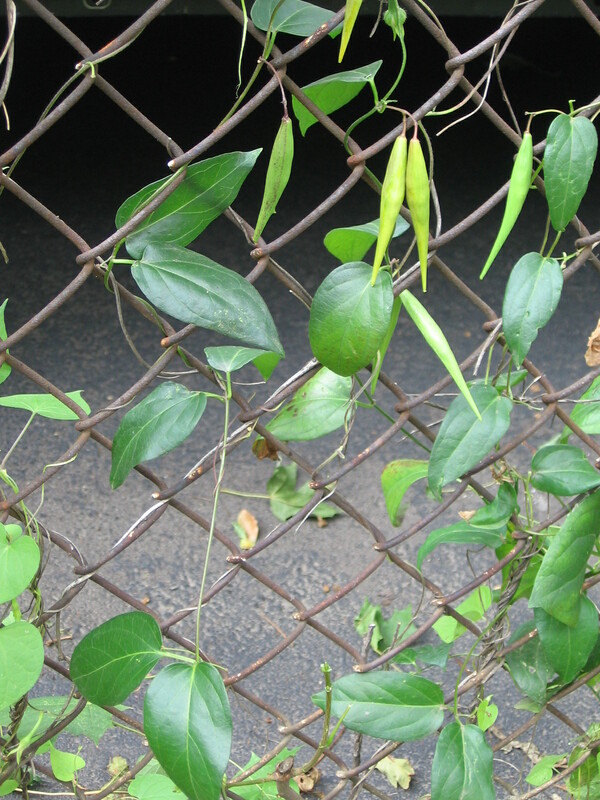 Many people don’t know the vine’s negative consequences and think it’s just an attractive foliage plant growing on their fence. Black Swallowwort is a member of the Milkweed family, but unlike Milkweed, it is not a reproductive food host like Milkweed is for the Monarch butterfly. Many Monarchs lay their eggs on Black Swallowwort leaves mistaking them for Milkweed. When the larvae eat the Swallowwort leaves which are toxic, they die. Unfortunately, this vine is encroaching on the Milkweed plants’ habitat. The vine’s stems are narrow and the leaves which are opposite one another on the stem are oval, shiny dark green with pointed ends. In June and July you’ll notice tiny purple flowers on the plant. When the flowers finish blooming, green seed pods form that reminds one of string beans but look more like chili peppers. 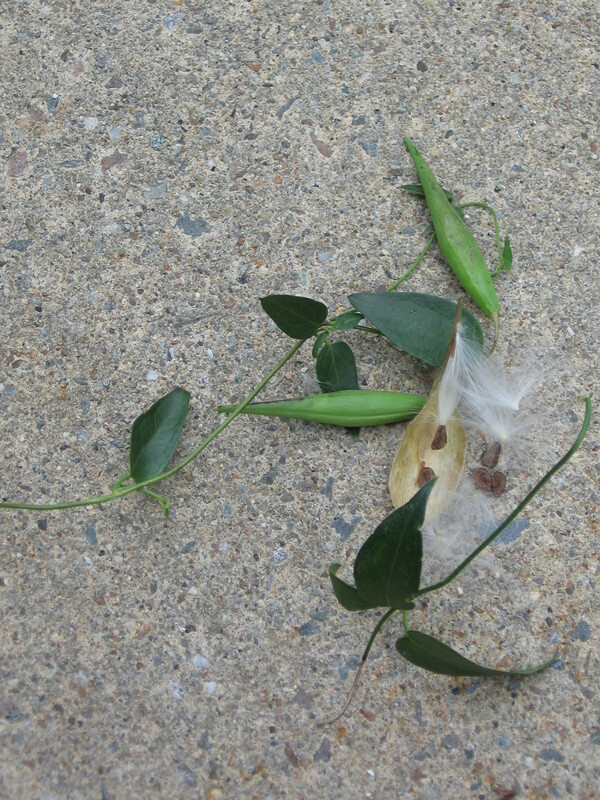 The pods turn light brown when ripe and then open up to reveal milkweed like seeds (small flat brown seed heads attached to plumes of silky white hair) that are dispersed by the wind. Getting rid of this noxious vine is very difficult. Just pulling the vine out of the ground doesn’t remove all of its roots. It has a complex root system most likely entwined with other plant roots, and the root crown and even the tiny white roots you’ll find, must be dug completely out of the ground to prevent more plants from coming up. If you notice tiny Black Swallowwort seedlings popping up around the larger vines, dig them up also. •	Lawn: Improve patchy or compacted areas by aerating with a pitchfork, over-seeding, and top-dressing with 1/2 to 1 inch of compost. Fertilize with 5-10-10 (can also do in October). •	Roses: Remove any diseased rose leaves from rose beds, control black-spot on the shrub with a fungicide spray (can do this throughout the summer), leave rose hips to promote dormancy, for winter color, and as nourishment for the birds. •	Continue to deadhead flowering plants (leave purple coneflower seed heads for birds). Good time to plant trees, shrubs, perennials, and best time to plant peonies. Wait until next spring to plant Azaleas and Rhododendrons. •	Peony, viburnum and hydrangea should be fertilized with bone meal. •	‘Winterize’ trees and shrubs by watering deeply when there’s not been sufficient rain. •	Keep pulling weeds (best to do when ground is moist but not soaking wet). •	When raspberry canes have finished fruiting, cut them off. Stake new canes. •	Divide perennials, and either replant divisions or give them away. 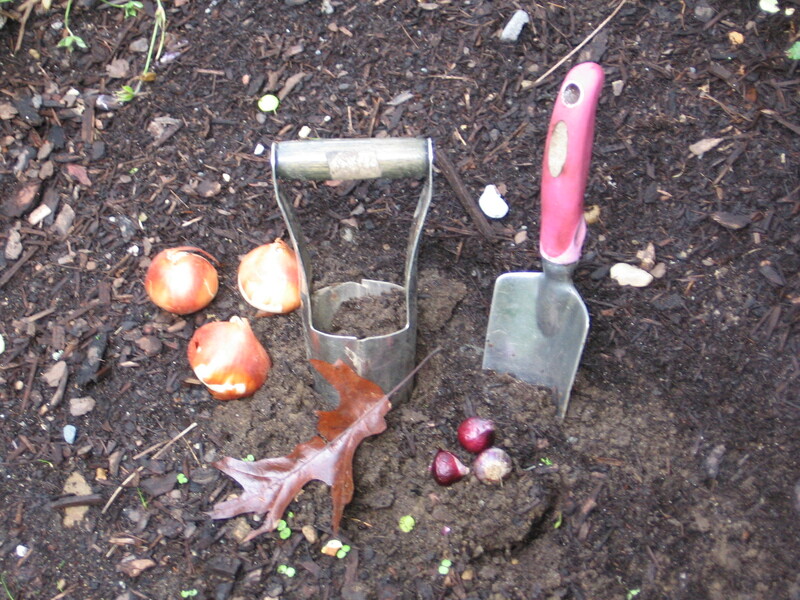 •	Begin planting spring blooming bulbs like daffodils, crocus and other small bulbs in mid-September. You can plant tulips as late as November. Scratch bulb booster into the top area of soil once you’ve planted the bulbs, and not into the bottom of the hole as it may burn the bulbs.